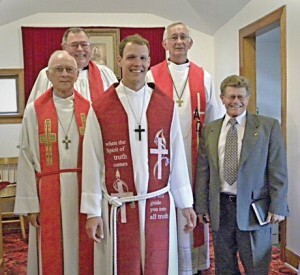 (l-r): St. Paul’s most recent pastors (l-r) Revs. Eldon Ohlinger; Richard Klein, Curtis Boehm; Garry Dombrosky and Lloyd Huber. HANNA, Alta. – At the 100th anniversary of St. Paul’s Lutheran Church in the Hand Hills, northeast of Drumheller, a crowd of more than 100 filled the little church and overflowed outside to hear God’s word preached by Rev. Richard Klein, who served St. Paul’s from 1986 to 1993. Rev. Curtis Boehm (Grace, Drumheller) led the worship service, which included Revs. Eldon Ohlinger, Lloyd Huber and Garry Dombrosky, each of whom served the parish during its long history. Following the July 18 service, the stories and memories continued at a reception at the Hand Hills Lake Club. The congregation gives thanks to God for the day of rejoicing, and seeks to continue in vibrant ministry to the Hand Hills community.